The feast day of Saint Lawrence is August 10th. As the patron of our school he is our model of care for the poor. Saint Lawrence was a deacon of the Roman Church during the time of Pope Sixtus in the year 257. Lawrence was in charge of administration of Church goods and care for the poor. During the persecutions under the Roman prefect Valerian in 258, Pope Sixtus was put to death and Lawrence was ordered to produce the Church’s treasures in 3 days. Lawrence is believed to have distributed the property and wealth to the poor and then presented himself to the prefect. When he was ordered to give up the treasures he presented the poor, the crippled, the blind and the suffering and said that these were the treasures of the Church. Lawrence was sentenced to death and tradition says that he was burned on a gridiron. 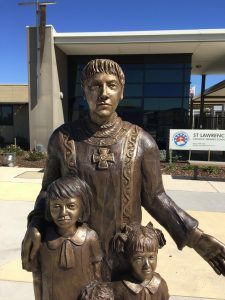 The courage and dignity of St Lawrence in facing death did much to gain respect for the Christian religion in Rome and after his death there was widespread conversion to Christianity. He is the patron saint of libraries, librarians, students and cooks.